Tokai University has taken the World Solar Challenge after one of the tightest last days in the history of the race. After 3,000 km and four days, less than 30 minutes separated first and second place, with The Netherlands' Nuon team running a close second. In a race disrupted by bushfires and rather unusually marred by a vehicle fire that somewhat crimped Team Solar Philippines’ style, the winners crossed the finish line at 1.05pm Darwin Time. Nuon is expected within another 40 minutes. Today’s stretch to the last compulsory checkpoint at Port Augusta was highly competitive with the Dutch Team Nuon hitting the mark about 25 minutes after Tokai. But Port Augusta to Adelaide turned in to a bit of a procession, with heavy traffic, a couple of road works and overcast skies impeding progress. 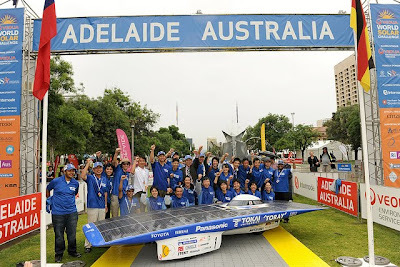 The solar car averaged 100km/h on the final stretch, despite the challenging conditions. Australia’s best-placed team is Aurora, currently placed fifth.